The Shroud of Turin bears the faded image of what appears to be a Christlike figure. Italian researchers say they've come close to the shroud's coloration by blasting strips of linen with ultraviolet laser light. Italian researchers have resurrected the idea that the Shroud of Turin's mysterious image of a Christlike figure could only have been created by a powerful flash of light — but skeptics still aren't buying it. Scientists have tussled with believers, and with each other, over the origins of the centuries-old cloth for decades: Many believers think it's the true image of Jesus, left behind miraculously on his burial cloths after his resurrection. Analyses of the Shroud's chemical makeup, as well as radiocarbon dating of fiber samples, have led lots of researchers to conclude that the image was painted onto the cloth during the 14th century. But other researchers, sympathetic to the Shroud's cause, say those tests were faulty. The Italian studies, conducted at the ENEA Research Center in Frascati, addresses a specific question in Shroud science: Could a burst of radiation have created the coloration seen on the linen? The answer is yes, although the results reported in the latest studies aren't a perfect match. So does that mean the Shroud image could only have been created by the flash of a miraculous resurrection? The answer is no, despite what you might read on the Web. "Sadly, we have seen many claims spread in the Web made by journalist/bloggers that discuss the content of a paper they never read," lead researcher Paolo Di Lazzaro told me today in an email. "It is obvious that a serious scientific work cannot prove any supernatural action. We have shown that the most advanced technology available today is unable to replicate all the characteristics of the Shroud image. As a consequence, we may argue it appears unlikely a forger may have done this image with technologies available in the Middle Ages or earlier. The probability the Shroud is a medieval fake is really low. In this sense, the Shroud image is still a scientific challenge." Di Lazzaro and his colleagues based their conclusions on five years of tests, using an ultraviolet laser apparatus and strips of modern-day linen. They blasted the cloth with UV at different power levels, and reported that they "achieved a very superficial Shroud-like coloration of linen yarns in a narrow range of irradiation parameters." The best effect depended on laser pulses lasting less than 50 nanoseconds. "These processes may have played a role in the generation of the body image on the Shroud of Turin," the researchers report. They don't go so far as to claim a miracle. But the fact that UV laser blasters didn't exist in the 13th century, let alone in Jesus' day, strongly implies that they suspect something out of the ordinary was going on. Di Lazzaro told me that the tests were not financed by ENEA, which is a government-sponsored research agency, and were conducted outside working hours. "The research was curiosity-driven, the attempt to replicate an image which is considered 'the impossible image' due to its very peculiar characteristics," he said. Over the years, Di Lazzaro and his colleagues have published a long list of studies, including peer-reviewed papers (see below). The latest studies were presented at a May conference in Frascati and published in November as an ENEA technical report (with a disclaimer saying that the contents didn't necessarily express ENEA's opinion). But they didn't really get traction until this week, just in time for Christmas, thanks to a series of sensationalized British news reports. Shroud science, also known as sindology, usually percolates outside the scientific mainstream — but every once in a while a sensational claim comes into the public spotlight. Joe Nickell, an investigator for the New York-based Center for Inquiry, has been following sindology for decades. He noted that the Italian research revives a discussion going back to the 1980s, spearheaded by a group called the Shroud of Turin Research Project, or STURP. "This is really nothing new," Nickell told me today. "This is a supposed vindication of STURP." Nickell said Di Lazzaro and his colleagues started out with the assumption that the coloration on the Shroud couldn't have been created by applying pigment to the linen — which runs counter to the conclusions drawn by other studies. Starting out with the idea that the human figure shown on the Shroud is an "impossible image" stacks the deck in favor of a miraculous explanation, he said. "Making the assumption of a miracle is a really, really, really, really, really big assumption," Nickell said. "That it's done in the name of science is just astonishing." Nickell said the latest findings don't prove much of anything, even though they're dressed up in high-tech tests. "It is made up of whole cloth," he said. "The pro-Shroud people start with the answer, and then they have to get some scientific evidence to back this up." From 2008: An American researcher says the Shroud of Turin might be the real burial cloth of Jesus after all. Some folks would suggest that the Shroud of Turin is a valuable focus for faith, whether it's real or not. What do you think? How much value is there in studying the Shroud, and how much impact do scientifico-religious debates like this one have on your own thinking? Check out the Web links below, give it some thought, and add your comments. Update for 4:15 p.m. ET Dec. 22: Di Lazzaro sent a follow-up email calling attention to his group's publications, which I've added below, and he poses this question for Joe Nickell: "Was he (or anybody else) able to reproduce by chemical paint, acid and any other color a depth of coloration which is 0.2 micrometer thick (that is, one-fifth of a thousandth of a millimeter)? We are talking of this, because on the Shroud, the image has a coloration depth so thin that it is impossible to do with any kind of painting. I can quote peer-reviewed papers that show this is the coloration depth of the Shroud image. "By the way, Nickell will be interested to know that using VUV photons we obtained this shallow coloration thickness," Di Lazzaro wrote. I'll pass the question along to Nickell, who says he doesn't use email. I suspect the answer could go along two tracks: One is that it's a tough thing to try to reproduce a precise coloration depth under any circumstances. The other is that centuries of wear and tear might have had an effect that's not easily replicated by the contemporary application of pigments or other chemicals. But we'll see what Nickell has to say. "Paolo Di Lazzaro claims the Turin 'Shroud' coloration depth is 0.2 micrometers, but surely he does not claim that that was uniformly measured throughout the cloth. The coloration indeed appears to be generally confined to the topmost fibrils (although the face image does show faintly on the back of the cloth). Using a two-part hypothesis I put forward in 1983, Italian chemist Luigi Garlaschelli has produced a replica shroud with such superficial staining. So let me ask Lazzaro a question in turn: Have you been able, using your high-intensity ultraviolet laser technique, to produce a replica shroud yourself? Until you do, shouldn’t you stop slashing carelessly with Occam’s razor?" Here's a 2009 Reuters report about the Garlaschelli replica. "In 1978, several sticky tapes were used to sample the Shroud in different points of the body image. When the image fibers were pulled out of the adhesive, their colored coatings had been stripped off the fiber and remained in the adhesive. These coatings were independently analyzed by Profs. Alan Adler and Ray Rogers, and all of them were too thin to measure accurately with a standard optical microscope. This means the thickness of all coatings was smaller than the visible light wavelength, say thinner than 0.6 micrometer. "Recently, these results have been confirmed by a direct measurement of another fiber, showing the thickness of the colored coating around the fiber is about 0.2 micrometer. As a consequence, there is quite a good probability most of the image fibers throughout the body image have a coloration depth smaller than 0.6 micrometers. "Prof. Garlaschelli claimed he obtained 'a superficial coloration' without mentioning 'how much' superficial. Is it 100 micrometers thick? 10 micrometers? One micrometer? Nobody knows. I asked chemists [who are] colleagues at ENEA, and they told me it is impossible to obtain a coloration depth smaller than 10 to 20 micrometers with the chemicals used by Prof. Garlaschelli. This fact alone means the results of Garlaschelli are not comparable with the Shroud image. Mr. Nickell may be interested to know Prof. Garlaschelli refused to reply the letter sent to the editor of JIST (the journal that published his results) where several points of his work were criticized, including the lack of a measurement of the coloration depth. "Coming to the question of Mr. Nickell: We never claimed to have reproduced the whole Shroud image. We were interested to gain a deeper insight into the physical and chemical processes that generated such an unusual image. And we were successful to find photochemistry processes that are able to generate a Shroud-like coloration of linen fibers. "Concerning Occam's razor, I am a scientist, and when I wish to understand a phenomenon, seeking for a scientific explanation, I use microscopes, spectrometers, image detectors and other laboratory tools. I see Mr. Nickell prefers using philosophical instruments like the medieval Occam's razor, a theory proposed in the 14th century. Each of us is free to choose the most familiar tool to find answers." "Di Lazzaro equates the depth of colored coatings that were stripped from surface fibers (using adhesive tape) with the depth of penetration that might be determined by cross-sectioning of actual threads, then asserts that a single fiber’s examination (still apparently not cross-sectioned) has 'confirmed' the dubious claims. Given the tremendous evidence against the 'shroud' — its incompatibility with Jewish burial practices, lack of historical record, bishop's report of the forger’s confession, the still-bright-red 'blood' which failed forensic serological tests, the presence of pigments and paints throughout the image, three laboratories' radiocarbon dating of the cloth to the time of the confession (1260–1390), and much additional evidence — it would seem that Di Lazzaro is straining at a gnat and attempting to swallow a camel. Let him produce a shroudlike image according to whatever theory he can muster, and we'll talk again." 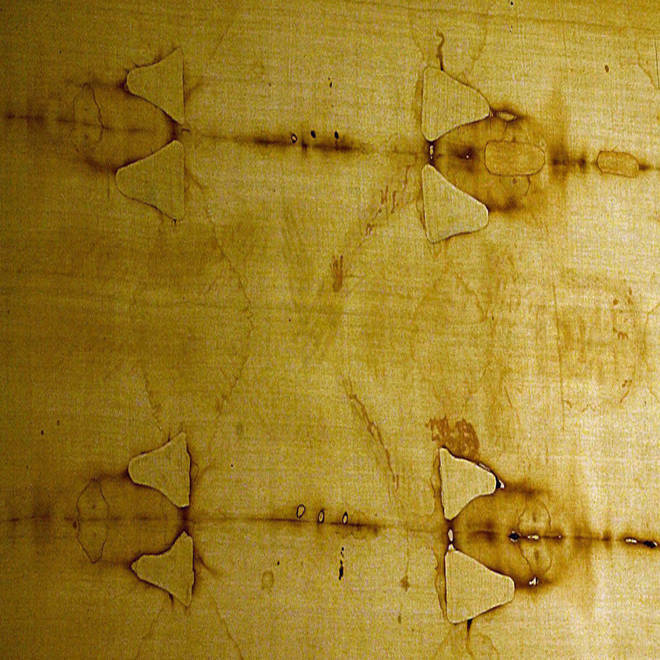 Could new test settle Shroud of Turin debate? G. Baldacchini, P. Di Lazzaro, D. Murra, G. Fanti: “Coloring linens with excimer lasers to simulate the body image of the Turin Shroud” Applied Optics vol. 47, 1278-1283 (2008). P. Di Lazzaro, D. Murra, A. Santoni, G. Fanti, E. Nichelatti, G. Baldacchini: “Deep Ultraviolet radiation simulates the Turin Shroud image” Journal of Imaging Science and Technology vol. 54, 040302-(6) (2010). P. Di Lazzaro, G. Baldacchini, G. Fanti, D. Murra, E. Nichelatti, A. Santoni: “A physical hypothesis on the origin of the body image embedded into the Turin Shroud” Proceedings of the Int. Conf. on The Shroud of Turin: Perspectives on a Multifaceted Enigma, edited by G. Fanti (Edizioni Libreria Progetto Padova 2009) pp. 116 – 125. ISBN 978-88-96477-03-08 01-12. P. Di Lazzaro, G. Baldacchini, G. Fanti, D. Murra, A. Santoni: “Colouring fabrics with excimer lasers to simulate encoded images: the case of the Shroud of Turin”, XVIII Int. Symposium on Gas Flow, Chemical Lasers, High-Power Lasers, edited by R. Vilar, Proceedings SPIE vol. 7131 (2009) pp. 71311R-1 – 71311R-6. P. Di Lazzaro, D. Murra, A. Santoni, G.- Baldacchini: “Sub-micrometer coloration depth of linens by vacuum ultraviolet radiation”, Proc. International Workshop on the Scientific approach to the Acheiropoietos Images, edited by P. Di Lazzaro (2010) pp. 3 – 10. D. Murra, P. Di Lazzaro: “Sight and brain, an introduction to the visually misleading images”, Proc. International Workshop on the Scientific approach to the Acheiropoietos Images, edited by P. Di Lazzaro (2010) pp. 31 – 34. G. Baldacchini, P. Di Lazzaro, D. Murra, G. Fanti: “Colorazione di tessuti di lino con laser ad eccimeri e confronto con l’immagine sindonica” ENEA RT/2006/70/FIM (2006). P. Di Lazzaro: “Wissenschaftliche Hypothesen zur Entstehung des Bildes auf dem Turiner Grabtuch” 30Tagen n.4 (2010) pp. 63-66. P. Di Lazzaro, D. Murra, E. Nichelatti, A. Santoni, G. Baldacchini: “Colorazione similsindonica di tessuti di lino tramite radiazione nel lontano ultravioletto: riassunto dei risultati ottenuti presso il Centro ENEA di Frascati negli anni 2005 -2010” RT/2011/14/ENEA (2011).